Explore the twilit lands as a spirit of light. The game plays somewhat like a shmup. However, you have no physical form, and can only travel by moving your spirit from one body to another. Rather than shooting enemies, you must enter their bodies to restore them to their normal forms. Click on anything to move to it. Convert red fish for points. An interesting concept! Can't wait to play it myself. I have something playable to show now. There's not nearly enough variety for it to be enjoyable, yet, but it should give you a better idea of how the game's mechanics will work. From what you have so far, this has a very interesting gameplay mechanic. Of course, when you constrain the player to the positions of the other objects in the game, it makes it much harder to dodge things, so I found it a bit hard at times, and sometimes felt as though there were no options for me to move to. I like the glowy graphics a lot, by the way. Once there's more variety in the obstacles and a more coherent level design, the game should open up more. I'm thinking of new names for the game so that googling it doesn't turn up a bunch of Twilight references. How do you think Twilit Universe sounds? 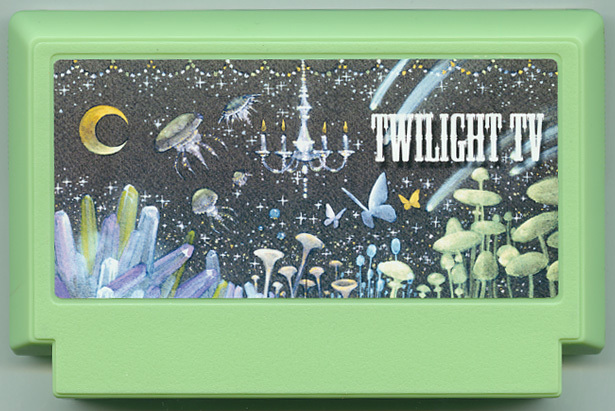 "Twilit Universe" sounds much better, and makes more sense with the premise than "Twilight TV." First of all, I love the visuals you got going there right now. The atmosphere is awesome. Can't wait to see what you make of this. Thanks. I'm going for a mystical atmosphere. I hope I have enough time to add a good amount of content, so it will really sink in. I uploaded a new version. The first 30 seconds or so of the game are exactly the way I want them. And then it loops. I've programmed a few more types of enemies that do not yet appear in the game. At this point, all that's really left is level design. I like it. If you fall off the screen, do you take damage, and then enter the nearest fish? You keep taking damage until you get back on screen. Going off screen is a bad idea. I uploaded a new version, with the first two minutes of gameplay completed. This release includes Urchins, Comb Jellies and health pickups. Let me know if the FPS (displayed in the lower left corner) ever drops below 30. FPS was fine for me too. This game is hard lol. Thanks. I'm glad the graphics didn't slow things down too much. How long did you last, JR Hill? As long as you made it to the urchins without taking too much damage, then the difficulty is about where I was aiming. Added a new version, with new waves of enemies, as well as the shield power-up. The shield allows you to move anywhere on the screen, and creates a temporary barrier around that spot that prevents all damage. I found it somewhat hard, too. Sometimes I felt as though I was losing health for no reason. Maybe a bullet had been created the same instant that I clicked on the fish? The fish flash briefly before firing. You should be able to avoid their attacks if you pay attention. Has anyone else had a chance to try this yet? I could use feedback on the difficulty, as well as the section where you first acquired the shield. Did the shield mechanic seem intuitive?